'BANK-MONUMENT COMPLEX' - WATCH A NEW ENCOMPASS PIECE NOW! To celebrate our two year anniversary (more on that soon!) we've put up a new video of 'Bank-Monument Complex' - a new darkly comic short play by Owen Collins which was performed at our hugely successful Big Pudding Party earlier this month. Watch, share and comment! A new darkly comic short play about assault, illness and hash browns. A conversation with a stranger forces David Hughes to realise some uneasy truths. 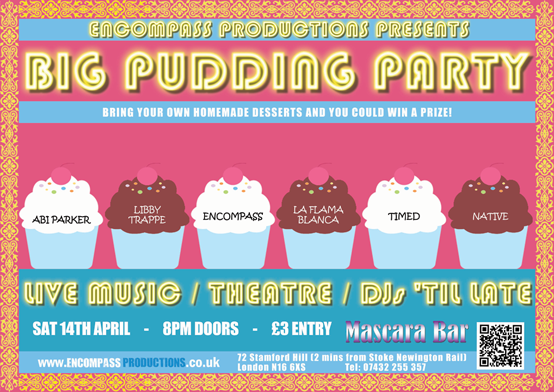 That's right, our brand new event is finally here and promises a truly fantastic evening of entertainment of all sorts! We have live music from Abi Bowden and Libby Trappe, plus DJs La Flama Blanca, Timed and Native will be bringing the house down with great music until the early morning hours. PLUS we'll be performing a brand new Encompass piece! 'Bank-Monument Complex' - a new darkly comic short play about assault, illness and hash browns. A conversation with a stranger forces David Hughes to realise some uneasy truths.' The piece will be performed by Alex Burnett, Helena Gullan and Frederick Clayton with direction from Jonathan Woodhouse and Owen Collins, who has also written the piece. STORMIN' NORMAN WRAPS FILMING - CATCH UP ON OUR PROGRESS! 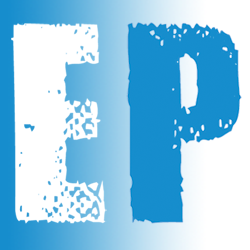 Encompass' first production on film recently wrapped and is now in post-production! 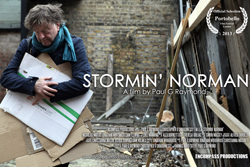 Stormin' Norman is a short dramatic comedy film written and directed by Paul G Raymond, an associate artist of Encompass who was last seen playing 'Lester' in our hit theatrical production 'What It Feels Like'. 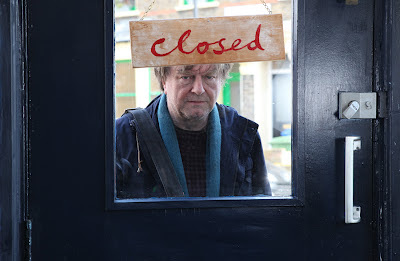 Stormin’ Norman follows Norman (Christopher O'Shaughnessy), a homeless man living in London. We journey with Norman through the ups and downs of his everyday life until he meets Sarah (Eva Lea), a young woman who dares to break the routine. Written and directed by Paul G Raymond, it is a comedy drama centred on an unlikely friendship between a grieving man and an aspiring musician. If you missed our live twitter feed from the shoot or haven't read the Stormin' Norman blog yet, then now is the time to catch up! The blog has an archive of all five days of shooting, each one written by a different member of the Stormin' Norman team. These blog entries provide an insight to the short filmaking process and feature exclusive behind-the-scenes images and stills from the film.You'll also be hearing updates all about the different stages of post-production as we ready the film for completion and try to distribute it to just about everywhere we can get it. That's all for now - but check back soon for more news!